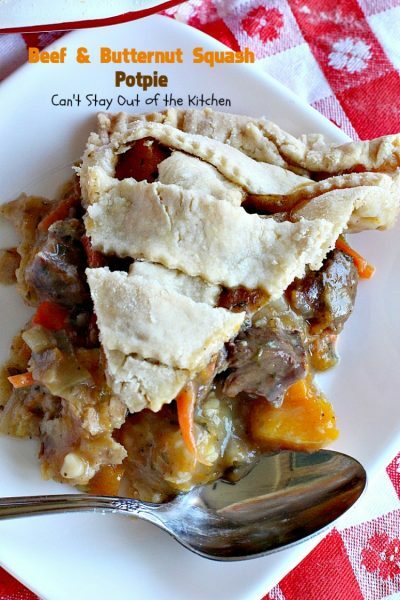 Beef and Butternut Squash Potpie is amazing. 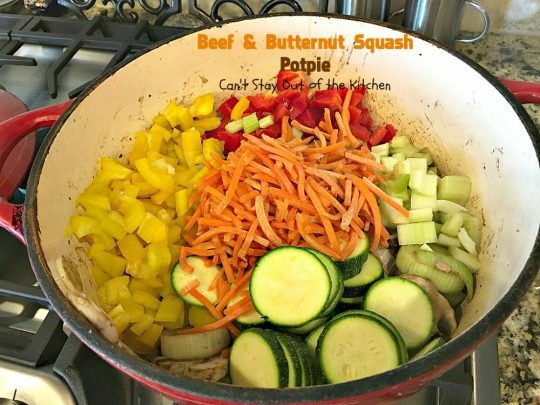 Steak is teamed up with butternut squash, apples, zucchini, mushrooms, carrots, bell peppers, onions, leeks and celery. It’s seasoned a little on the savory side but then it also has just a hint of sweet spices like cinnamon and nutmeg to make the point but without overwhelming the dish. 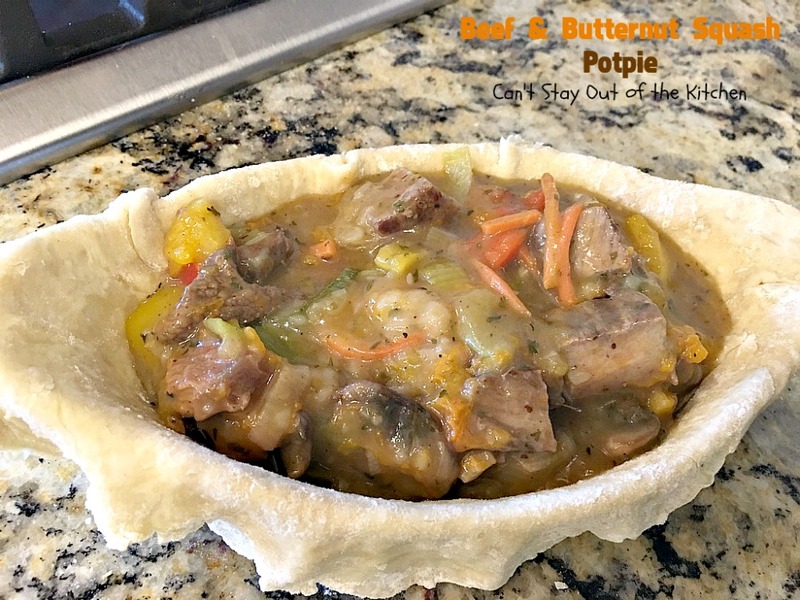 This potpie could not have been more perfect! These little potpies were wonderful. I actually baked one in a large deep dish pie, two in round ramekins and 4 in oblong bakers. I had enough filling for at least one more of the smaller baking dishes but I ran out of pie crust so I settled with this amount. I was on a potpie binge a couple of weeks ago and made my very first potpies with beef. Then I decided to try one with butternut squash instead of potatoes and with a very subtle sweet edge. Oh, my. 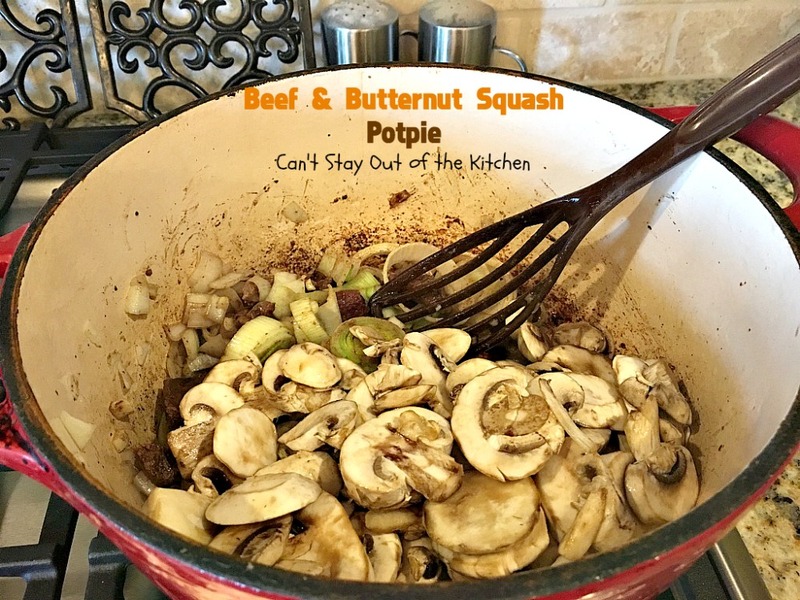 These potpies were heavenly. I ended up giving away the four that I made in the small oblong baking dishes to friends down the street who had a lot going on with their kid’s end-of-the-school-year programs. I think we all fell in love with these delicious potpies! 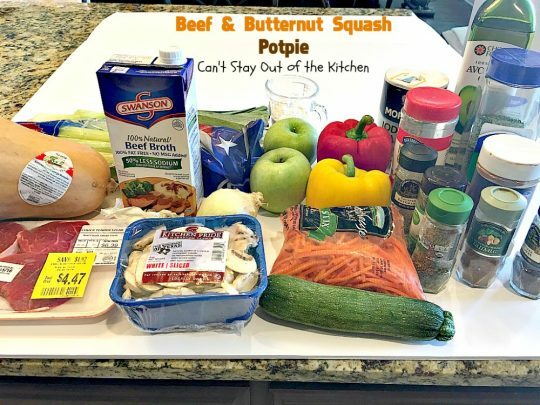 If you are going to give this potpie a try, I highly recommend that you go out and purchase all the ingredients. Don’t leave anything out. 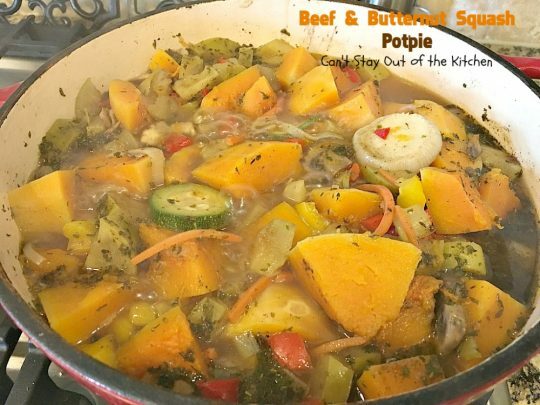 You will need all the savory flavors from the veggies and herbs to balance the sweet flavors from the butternut squash, apples and spices. It is perfection this way. But if you try to fool around with the recipe too much, you will probably not achieve the sumptuous and delightful dish that I did. 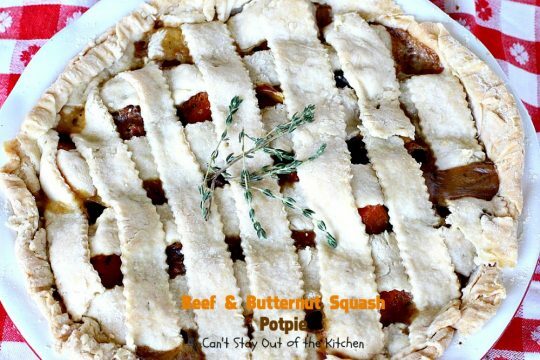 Beef and Butternut Squash Potpie will have you drooling. Butternut squash, apples, and sweet spices are combined with steak, veggies and savory herbs for the ultimate potpie experience! You can bake these potpies in almost any kind of container. The recipe is enough to make 3 large 10-inch deep dish pies. So if you don’t have a lot of company coming over for dinner, you can freeze some of the potpies and bake later, or cut the recipe down for your immediate needs. Brown beef in avocado oil. Cover with lid and cook about 15 minutes until beef is tender. Add leeks, onions and garlic. Saute a few minutes. Add mushrooms and saute about 5 minutes longer. 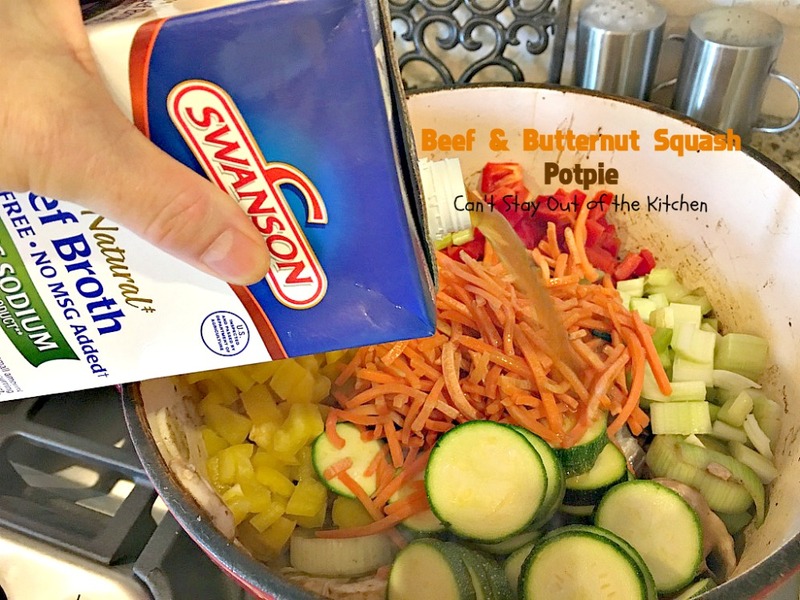 Add bell peppers, zucchini, carrots and celery. Add seasonings. Cover with lid and simmer about 15-20 minutes or until squash and carrots are fork tender. Here the veggies are tender. Combine flour and water and make a thin paste. Add to beef mixture and heat through until thickened. 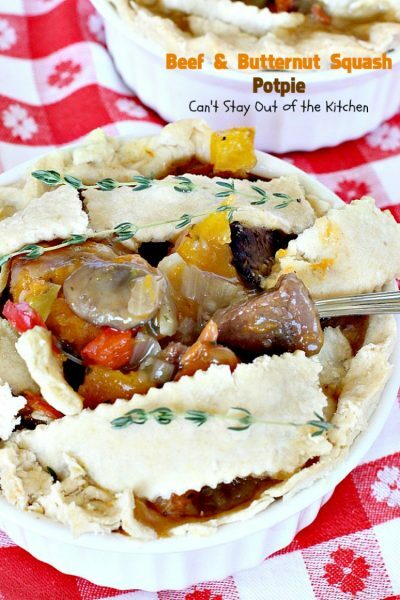 Roll out pie crust and fit into individual ramekins or pie plates. 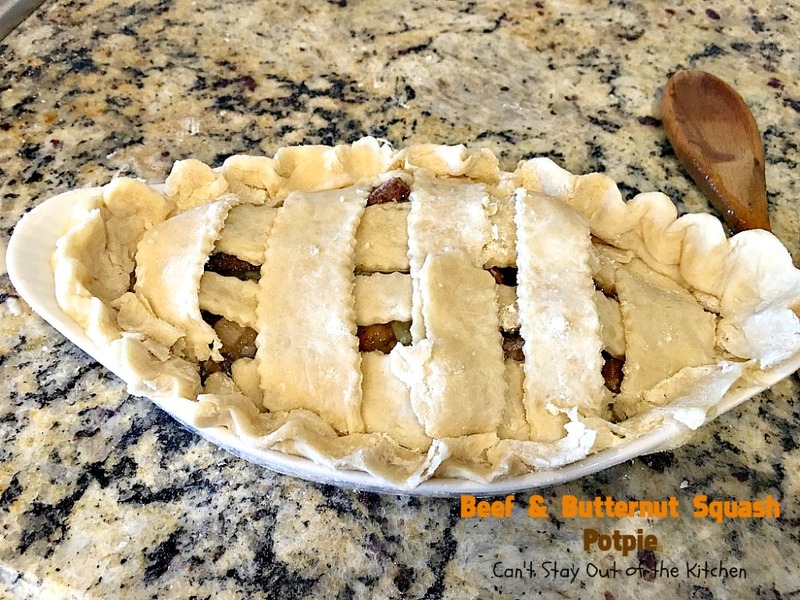 Do not add the filling until the top crust is ready. Otherwise if the filling sits in the crust too long it will get soggy. Here’s one of the smaller oblong dishes. Flute edges, cover with lattice crust. On the smaller ramekins, I decided to only put the crust in strips in one direction. Bake at 350 about an hour or until mixture bubbles up thickly between the crust. If necessary, tent with foil to avoid over-browning the crust. The smaller dishes took between 45 minutes and an hour to bake. 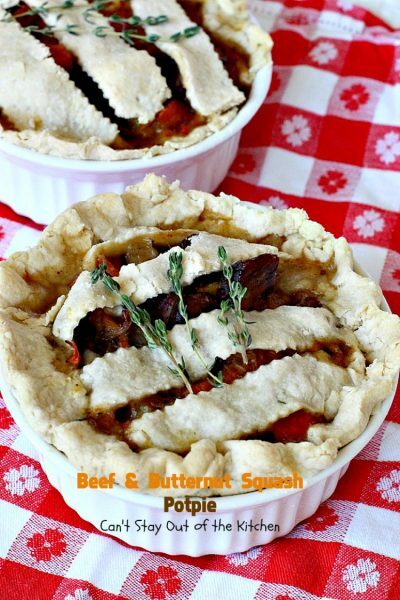 Beef and Butternut Squash Potpie is so succulent and delicious, you will find it on your dinner menu often. 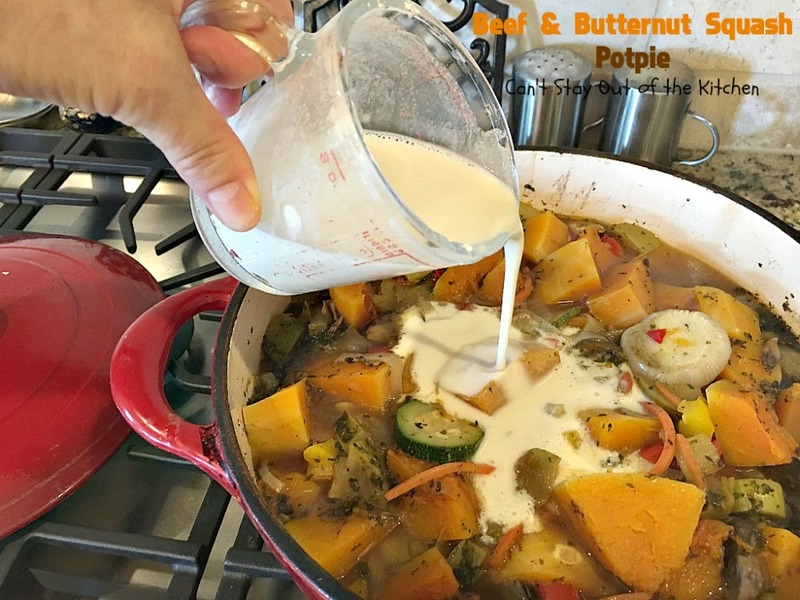 Especially in the winter months when you want hot, comfort food like this. This potpie is incredibly hearty, filling and very satisfying. 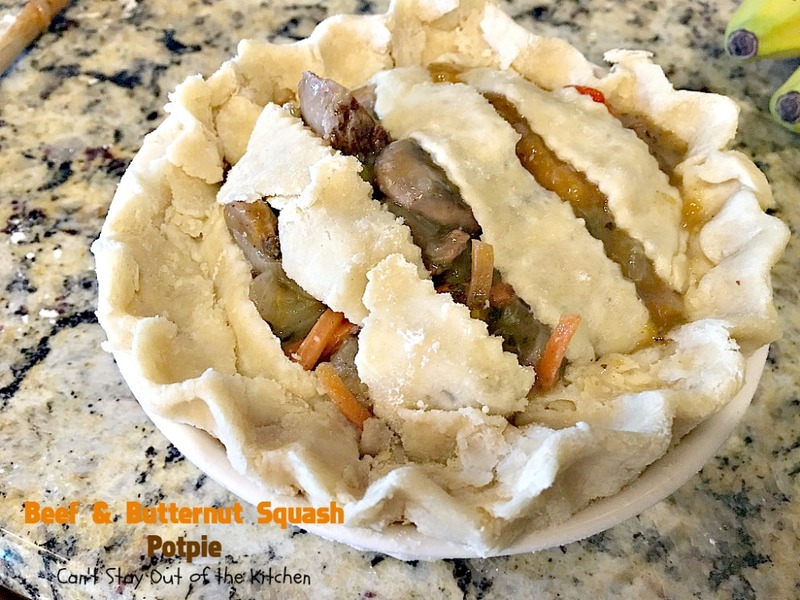 If you enjoy potpies like I do, you’ll love this one made a little on the sweet and a little on the savory side. I guarantee, once you try one bite of this gourmet-style potpie, you won’t want to stop! 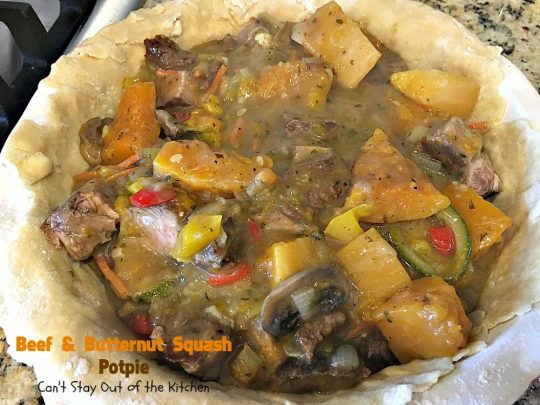 This lovely potpie is filled with steak, butternut squash, zucchini, carrots, mushrooms, apples and seasoned with thyme, rosemary and marjoram and also spiced with cinnamon, nutmeg and cloves. 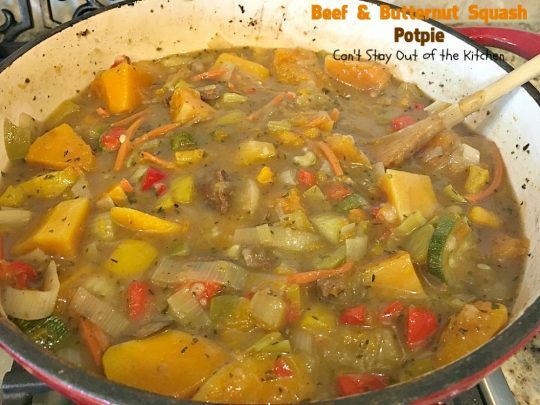 It's one of the best potpies you'll ever eat. 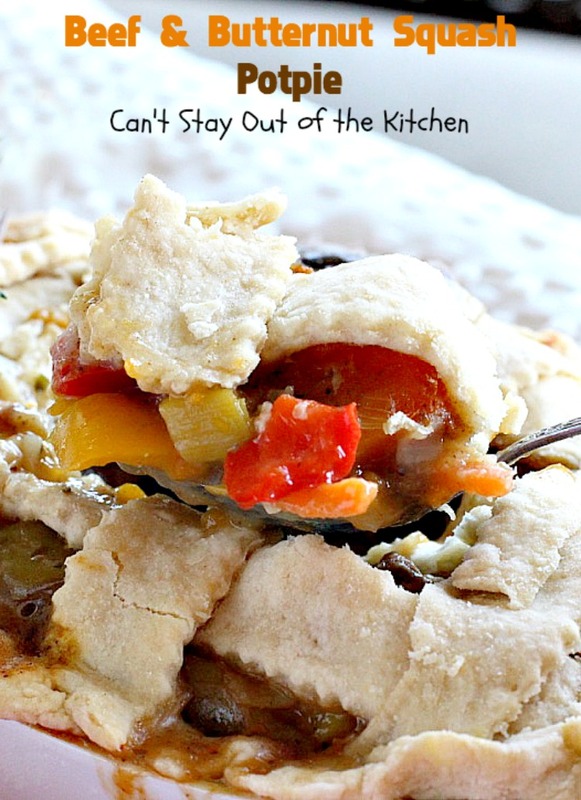 This one is made with a scrumptious Homemade Coconut Oil Pie Crust. Melt avocado oil in a very large skillet. Cook a few minutes turning over each side so no pink remains. 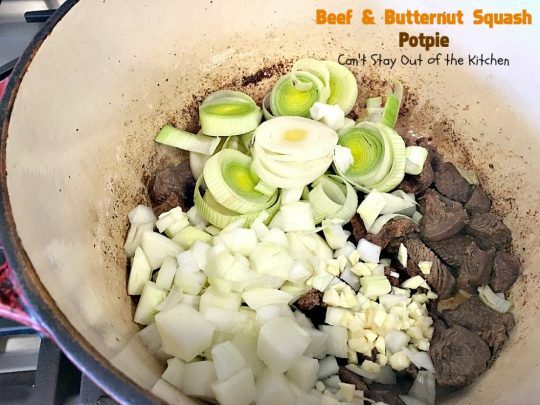 Cover with lid and continue cooking, stirring occasionally, about 15 minutes until beef is tender. Add onions, leeks and garlic. Stir to combine and continue cooking with lid on another 5 minutes. 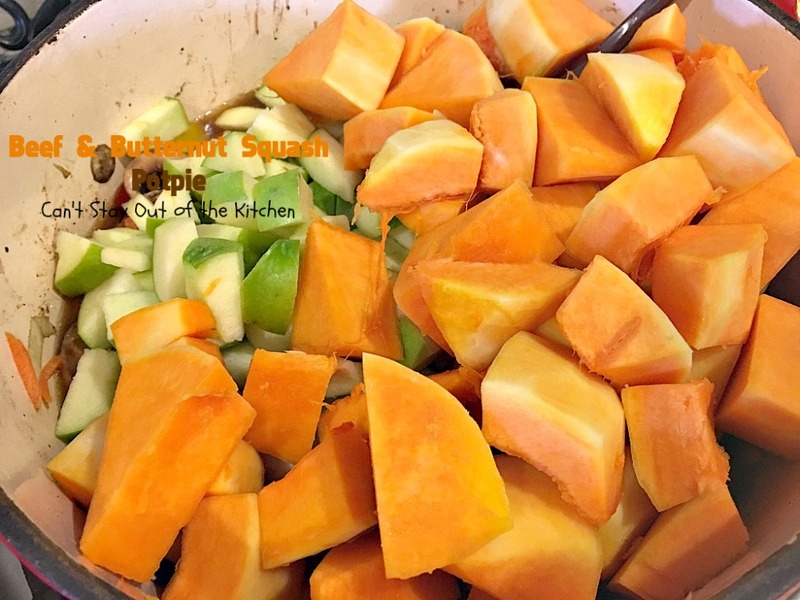 Add butternut squash, apple, celery, bell peppers, zucchini, carrots, beef broth and seasonings. 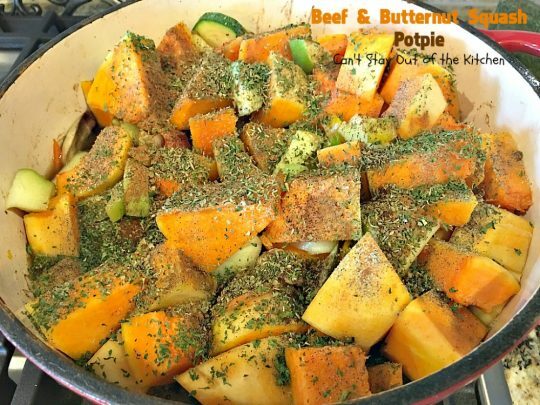 Cover with lid and cook until butternut squash and carrots are fork tender, about 15-20 minutes. Dissolve flour in enough water to make a thin paste. Cook a few minutes until mixture thickens. 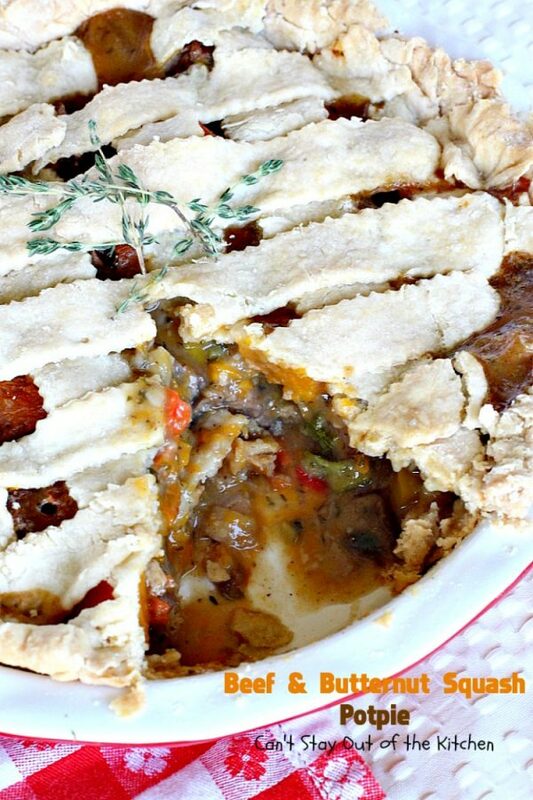 Fit bottom crust into three different 10-inch deep dish pie crusts or about 12 large ramekins. 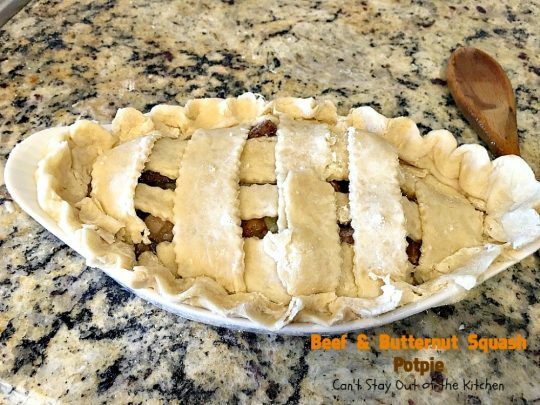 Divide beef filling between each pie. Make about 6 slits in the pie for filling to bubble to the surface. Bake at 350° about 45 minutes. Reduce heat to 300° and bake an additional 15-20 minutes, or until filling bubbles up thickly through slits or lattice crust and tests done. 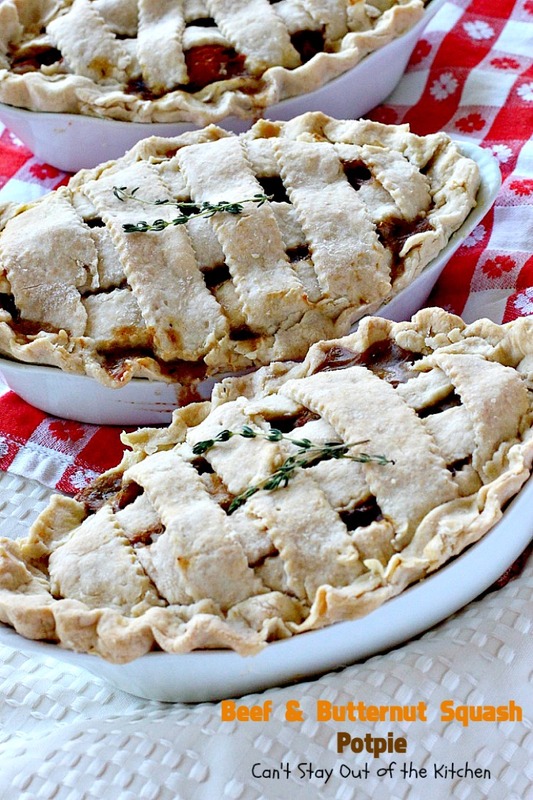 If necessary, tent pies with foil to avoid over-browning. Yield: Each pie serves 6. Cut in coconut oil with a pastry blender. Use as much as needed to get the flour to look like coarse meal. Add ice water – enough that you can stir the dough and it mostly adheres together. Form dough into six grapefruit sized balls. Place waxed paper on counter. Sprinkle very generously with flour. Place one of the dough balls in center. Cover with more flour and additional waxed paper. Roll out from the center to the edges, about 1/8” thick forming a circle that will completely cover the bottom and sides of pie plate. Fit dough into pie plate. Repeat, fitting dough into additional pie plates. Roll out remaining dough and have available for top crust. 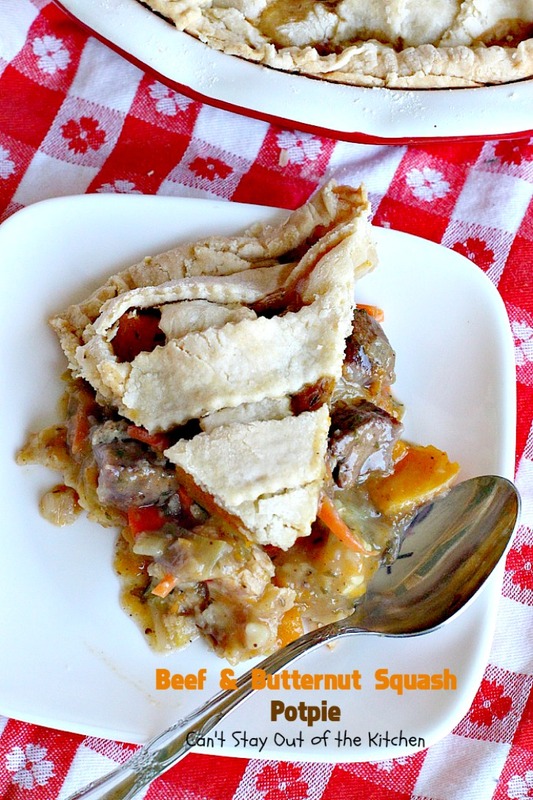 Divide beef pot pie filling between each pie shell. Cut slits in the top to allow steam to escape. NOTE: You can also freeze one or two of the pies before baking. Thaw several hours before baking, or bake frozen until cooked through – probably about 2 hours. NOTE: You can also bake these in 12 individual large ramekins. 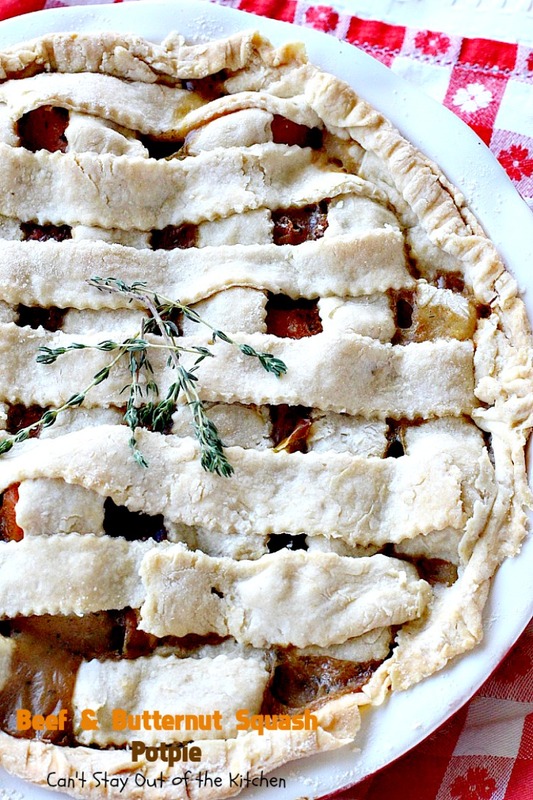 NOTE: You can use a lattice crust for the top. NOTE: I used 1 lb. of top sirloin and 1 ½ lbs. of previously cooked steak. I added the pre-cooked steak at the very end before putting the filling into the pie shells. NOTE: I baked the large pie about 1 hour to 1 hour 10 minutes, the other smaller dishes took about 45 minutes to an hour (at 350). NOTE: Preparation time does not include time required to make or roll out pie crust. 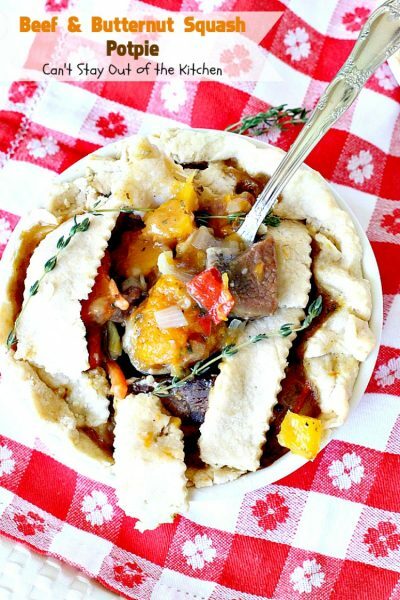 This lovely potpie is filled with steak, butternut squash, zucchini, carrots, mushrooms, apples and seasoned with thyme, rosemary and marjoram and also spiced with cinnamon, nutmeg and cloves. It’s one of the best potpies you’ll ever eat. 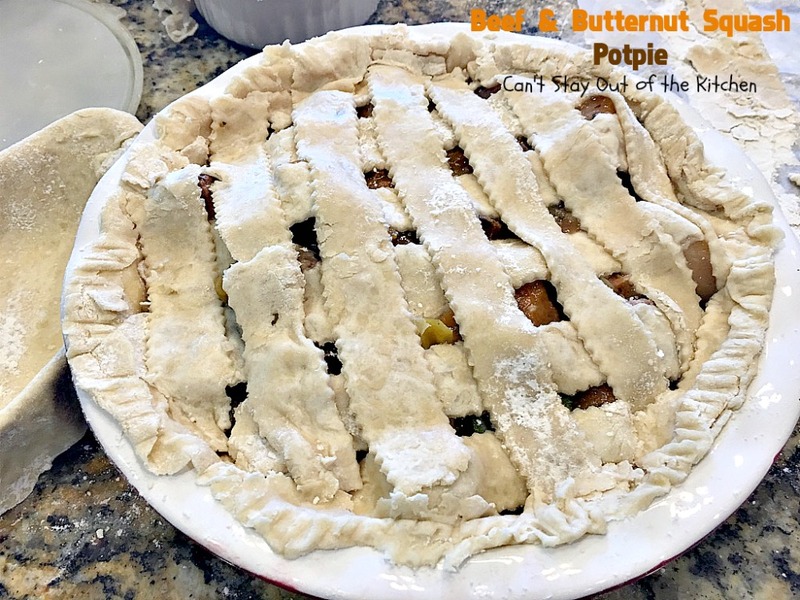 This one is made with a scrumptious [url href=”http://cantstayoutofthekitchen.com/2016/06/02/homemade-coconut-oil-pie-crust/” target=”_blank”]Homemade Coconut Oil Pie Crust[/url]. You can also freeze one or two of the pies before baking. Thaw several hours before baking, or bake frozen until cooked through – probably about 2 hours. [br][br]You can also bake these in 12 individual large ramekins. [br][br]You can also use a lattice crust for the top. [br][br]I used 1 lb. of top sirloin and 1 ½ lbs. of previously cooked steak. I added the pre-cooked steak at the very end before putting the filling into the pie shells. [br][br]I baked the large pie about 1 hour to 1 hour 10 minutes, the other smaller dishes took about 45 minutes to an hour (at 350). [br][br]Preparation time does not include time required to make or roll out pie crust. These elegant potpies are great for a company dinner. They also reheat wonderfully for leftovers. Every bite of Beef and Butternut Squash Potpie will have you drooling. No kidding. This stuff is amazing. I made this in a Homemade Coconut Oil Pie Crust. The ingredients for the filling are actually very clean.